Andie Bottrell is a multidisciplinary creative and the owner of Designing Indie. Andie performed her music at #MeToo Springfield's 1 in 6 show on March 8that Q Enoteca featuring all female musicians, comics, poets, and artists. The Springfield Newsleader did an article on women in comedy in Springfield, MO and featured Andie. Andie returned to perform at Chatty Cathy: A Women's Storytelling Event (see video on Blog)! Andie performed forWe Still Like You (live show & podcast) ​at BookMarx. ​Beginning in October 2018, catch Andie on Showtime in the movie Above Ground​. Andie returned to the Springfield Art Museum to create a living tableau for their 99x Cirque event September 2018. Andie's webseries SEEK HELP was nominated for Best Comedy Series, and Andie was nominated for Best Director, Best Overall Writer, and Best Overall Actress at the Ozark Mountain Webfest this September 2018 in Branson, MO. Andie won Best Overall Writer. Andie played Jenny in the play The Christians at Springfield Contemporary Theatre MARCH 23-25, 30-APRIL 1, 6-8, 2018. Andie's Mostly Black & White exhibit at the Springfield Brewing Company was up all month in February & March 2018. Andie's webseries SEEK HELP Season Two was successfully funded through Seed&Spark, while Season One has been making the festival rounds playing in New York, Canada, and Arizona! 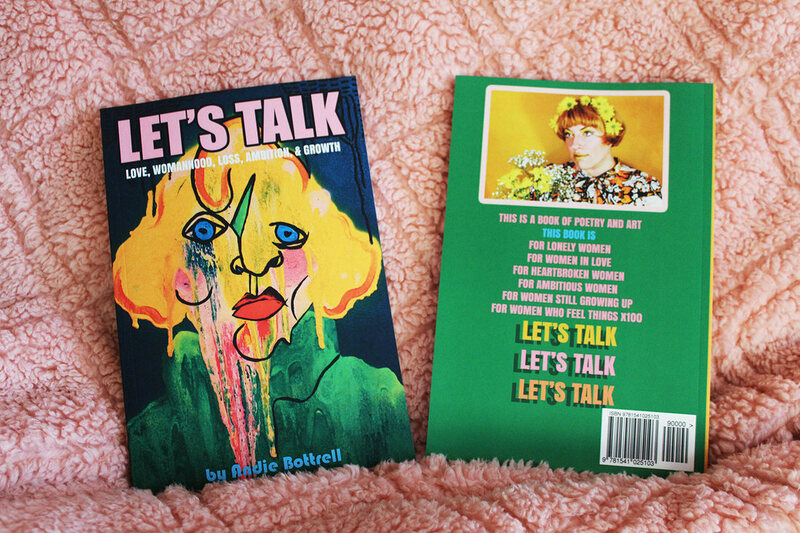 Andie's book of poetry and art LET'S TALK was published October 2017. Buy it on Amazon.com, or in Andie's Etsy shop. If you're a Springfield local, you can also pick up a copy in person at BookMarx or Arts & Letters. Andie joined a phenomenal ensemble in the run of GOOD PEOPLE at Springfield Contemporary Theatre September 8th through the 24th. Andie's gallery show of ink portrait line drawings at Rosette Studioes: Arts & Letters called Lines Were Drawn: Heroes & Heroines ran the month of April 2017. Andie spoke on a panel for the Public Affairs Conference called "Should All Children Be Taught The Arts?" at MSU. ​Andie premiered a gallery show at Tea Bar & Bites in March 2017 featuring abstract and figurative spray paintings. It was called "Fun and kind of twisted." Andie's artwork and styling were on display at the Springfield Art Museum for their 99x Bohemian Belle. Andie was nominated for Best Actress in the Sato48 film Good Girl directed by Shannon Michelle and written by Ellen Simmonds. Watch on the Video page! ​ In May, Andie's first solo art show "The Break-Up Art Show" premiered at BookMarx for First Friday Art-Walk, featuring nearly 100 new paintings, two books of hand written and illustrated poetry, and an interactive "Heartbreak Journal" for patrons to share their own tales of woe. Andie acted in the feature film The Weight with Clayne Crawford. "The Weight is a noir thriller about a divorcee who's pulled into a small town crime ring when her ex-husband goes missing and the local sheriff refuses to help." Andie played Ruth in Springfield Contemporary Theatre's production of TRIBES by Nina Raine, Directed by Richard Dines. "Best ensemble cast in recent memory..."
"Andie Bottrell is excellent...supplies humorous shadings to Ruth's acid-drenched barbs."